At this website you can purchase construction plans to build this Castle Playhouse / simple swing set plans featured above. Dimensions: Castle 6×8′ on the ground, and 8×10 at 2nd floor. Overall ground area including swings and slides, etc.. will require a 25′x25′ area. Be sure and see our other sight offering Pirate Ship Playhouse Plans – HERE! These are easy to follow – step by step – construction prints using non-techie language. Anyone can build from these plans regardless of woodworking knowledge. These are simple playhouse building plans for a wood castle playhouse. A video library will be coming soon making these Simple Playhouse Plans even easier! The videos will give greater step by step instruction and will actually help you read between the lines. My desire is to make this so easy to follow that anyone can build this project and save over $4,000 by doing-it-yourself! If you would like to see a couple pages of these backyard fort plans just enter your name and email address into the form on the left. In doing so you will have instant access to see some samples and join my email list. You’ll receive an email from me about 6 times a year announcing “Do it yourself” projects and new releases. You can unsubscribe anytime at the bottom of the emails. 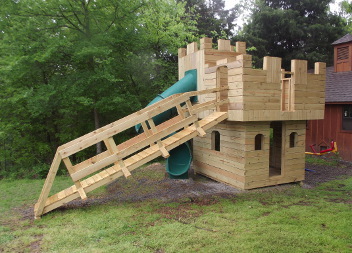 If you are looking for castle playhouse plans outdoor application this is it. This castle playhouse plans wooden model is designed to last for ages. Our outdoor playhouse plans call for treated lumber for durablility. And though it may look difficult they are simple playhouse plans. We have gone all out on these backyard playhouse plans packing as much detail into to these drawing as possible. These are really neat castle swingset plans playhuts. These backyard swing set plans not only show how to add the swings we have included with these simple fort plans blue prints to construct your own 14′ long slide. Home made swing set plans that save you money. When looking at the design of our castle playset plans playhouses it appears more like a castle than most. Most of the available backyard playhouse kits are poorly designed and tend to fall apart too easily. If you want to build a play fort you need these blueprints for forts. This is a backyard swing set plans kids will love to play on. Our Castle Playhouse Plans Playhuts works great as a Princess playset plans playhuts. The tools you’ll need to build these castle playhouse plans are common. You can see a list of tools here. The time it will take to build this castle playset plans playhuts will depend on you. A week would be a good estimate for a novice. purchased online – when do I get the info? I’m interested in incorporating a swing beam right into the castle structure to allow for one swing/rope swing/trapeze off either side, rather than tacking on a large multi-swing swing beam. Can your plans include this? Wooden Castle Playhouse Plans can be found on this site.